ROME, Jul 26 2016 (IPS) - With some 400 million people around the world infected with hepatitis B or C, mostly without being aware, the United Nations top health agency encourages countries to boost testing and access to services and medicines for people in need to combat the ‘ignored perils’ of this disease. A staggering 95 per cent of people infected with hepatitis B or C do not know they are infected, often living without symptoms for many years, the World Health Organisation (WHO) warns. And over 90% of people with hepatitis C can be completely cured within 3–6 months. “The world has ignored hepatitis at its peril,” said Dr. Margaret Chan, WHO’s director general, ahead of the World Hepatitis Day, which is observed annually on 28 July. “It is time to mobilise a global response to hepatitis on the scale similar to that generated to fight other communicable diseases like HIV AIDS and tuberculosis,” she said. The number grows by 6 to 10 millions a year, WHO reported, while announcing plans to release new testing guidelines for both hepatitis B and C.
The theme of this year’s World Hepatitis Day is Know Hepatitis; Act Now. Together with its partner, Social Entrepreneurship for Sexual Health, WHO on July 25 said it recently launched #HepTestContest, a global contest to show how the testing guidelines could translate into real action on the ground. The contest received 64 contributions from 27 countries, WHO said. Five finalists were selected by a panel of experts including representatives from WHO, the World Hepatitis Alliance and Médecins sans Frontières, who reviewed the testing models for innovation, effectiveness, and plans for sustainability. “From prisons in Australia, use of an internet-based risk self-assessment tool in the Netherlands, community testing camps for drug users in India, to testing in primary care in Mongolia we learned some great lessons about how to build awareness of this hidden disease, improve testing rates and link those infected to treatment and care,” Philippa Easterbrook added. “Bringing together pharmaceutical companies, government, research organisations and communities to help negotiate price reductions make hepatitis treatments more affordable,” said Easterbrook. 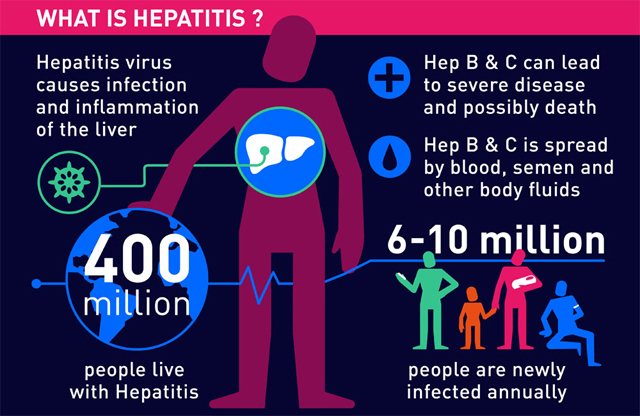 In May of this year, the World Health Assembly – WHO’s decision-making body – called for treating eight million people for hepatitis B or C by 2020, to reduce new viral hepatitis infections by 90 per cent, and to decrease the number of deaths by 65 per cent in 2030, as compared with 2016. These targets are part of the first ever Global Health Sector Strategy on viral hepatitis.